Denny Hamlin plans to win one of the next three Monster Energy NASCAR Cup Series races, all tracks that set up nicely for the driver of the No. 11 Joe Gibbs Racing Toyota. But if Hamlin can’t take a checkered flag at Martinsville (the site of Sunday’s First Data 500), Texas or Phoenix, he’ll become a fan of fellow Toyota drivers Martin Truex Jr., the series leader, and JGR teammate Kyle Busch. Under the stage-based racing format NASCAR introduced this season, Truex and Busch have earned the lion’s share of playoff points. Consequently, they enter the Round of 8 of the Monster Energy NASCAR Cup Series Playoffs with a built-in advantage. After the race last Sunday at Kansas, Truex has 4,069 points entering the round, and Busch is second with 4,042. But if Truex and Busch both win and advance to the Championship 4 event at Homestead-Miami Speedway on that basis, the race for the one position certain to be awarded on points is wide open. Only 20 points separate third-place Brad Keselowski from eighth-place Chase Elliott. 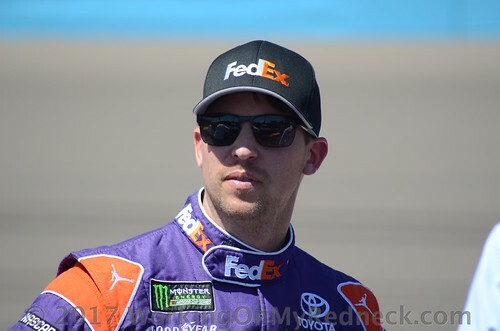 “You want the guys that have a point lead on you – the bigger point leads on you – to have good days and essentially win,” said Hamlin, who is sixth in the standings, 12 points behind Keselowski. “Yeah, I definitely would be rooting for those guys if we don’t win. Next Article Another Andretti In NASCAR?